GIRLS NIGHTS AND HENS PARTIES ARE AVAILABLE AT THE CITY AND MIRANDA STUDIOS!!! A hens night at Bobbi’s Pole Studio is a feast of extravagant costumes, music, and creative entertainment! Confirm your booking with a credit card deposit of $45, the remainder to be paid in cash on the day. There is a $200 cancellation fee. 48 hours notice is required for the number of guests attending. The confirmed amount of guests will be charged on the night. If you have less than 6 attending, you will need to pay the minimum charge of $270. It’s $15 per person for non-participants. You might come up with a brilliant idea that you want include in your night and that’s great, we can work with pretty much anything so let us know what you want. If you would like to book any extras or if you have any further questions please call the Studio on the number below. 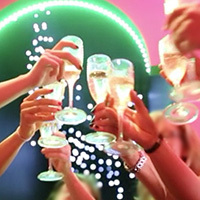 Call (02) 9264 0080 to book your hens night!